Join Scroobius Pip as he gets to the bottom of what matters most in life: whether getting Russell Brand to expound on capitalism, Jon Ronson on the perils of social media, Simon Pegg on the power of satire, Killer Mike on race relations in the United States or Howard Marks on drugs and cancer, Pip elicits thought-provoking material by rummaging through the minds of some of the most interesting creatives of our time. 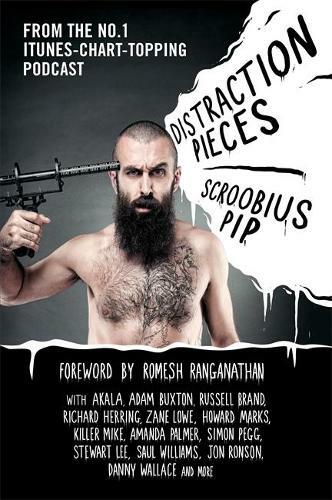 Distraction Pieces features both curated highlights from the iTunes-chart-topping podcast - from Akala to Howard Marks via the likes of Adam Buxton, Romesh Ranganathan and Amanda Palmer - and exclusive new content, with chapters on politics, social media, music, comedy and more. Featuring illustrations by tattoo artist mr heggie, this is a must-have for fans of the Distraction Pieces podcast, and a must-read for anyone interested in the creative mind. The Scroob's twist? His sweet nature. He's not a journalist, he's a fan, and he disarms his subjects into revealing more than they would in a conventional Q&A. The result is a rambling, intimate, funny 90 minutes with a creative type.